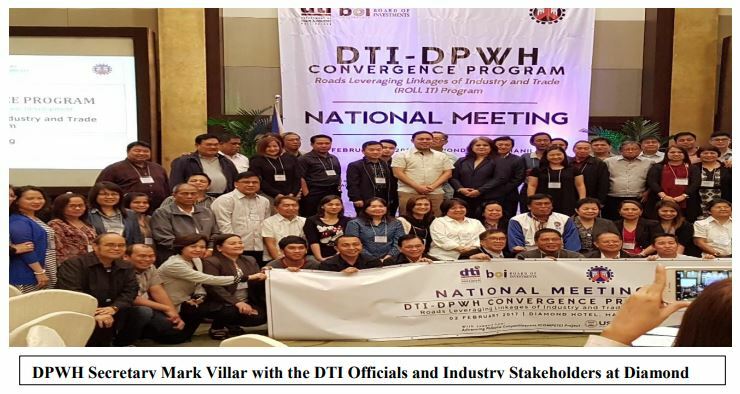 The National Meeting of the DTI-DPWH Convergence Program presented to the stakeholders who are representatives of the twelve (12) priority industries which included the Chemical Industry that havebeen identified to benefit from the Roads Leveraging Linkages of Industry and Trade (ROLL IT) Program. DPWH Secretary graced the event to reiterate the current administration’s commitment to increase infrastructure spending and the creation of the convergence program. The Timeline of the Program began in August 2016 with the research and design of the ROLL IT Program which was completed in October 2016. This was highlighted during the Manufacturing Summit on November 29, 2016 where a Memorandum of Agreement (MOA) between DTI and DPWH was signed by DTI Secretary Ramon Loez and DPWH Secretary Mark Villar. This was followed by the Industry Stakeholders Consultation on January 31, 2017 after the details of the program and the draft guidelines have been completed. The Chemical Industry with the help of the BOI Investment specialist identified a chokepoint in the General Mariano Alvarez commercial area during rush hour because cargo trucks passing through Governor’s Drive to transport materials and products through and from the industrial estates and export processing zones in Dasmaninas, General Trias and Rosario in Cavite have to grind out through heavy traffic in this stretch of road. This was included in the geotagging for the construction of a by-pass road in addition to what was identified earlier during the Chemical Industry Cluster TWG meeting. The Position Paper was more of a representation by SPIK on the request of a member to consider the establishing of a threshold concentration of GBL in the product the company is importing to exempt it from regulatory requirements. The peculiarity of GBL compared to other dangerous addictive or psychotropic drugs is its industrial application as a cleaning agent. It is traded in enormous quantities all over the world. Chemical Industry Brochure prepared by DTI-BOI is now available and ready for publication. The SPIK Secretariat has been provided a copy for dissemination to the Board of Directors. The president has been sent a copy as well. The BOD may view it during the board meeting. SPIK through the initiative of past president and ex-officio director Gretchen Fontejon-Enarle organized the Industry Stakeholders meeting supported by BOI on the draft FDA HUHS Administrative Order which will effectively repeal FDA AO 2015-0038. The meeting was presided by Director Eries Cagatan of BOI. The draft AO is a cause of concern by the affected industries as shown by the very good attendance and active participation in the discussion by the representatives of the following industry associations: PAPIM, EDC, PhilExport, PAPM, Philippine Stationeries Association, SDAP, CCIP, and SEIPI. 7. Coordinate with Arthur Yap- Chairman of Economic Committee for possible discussion of the issue. The public consultation is on the Joint Department Order (JDO) for the Creation of One-StopShop (OSS) Facility for Relief Consignment. Thus covers importation of relief goods, donated or leased to government institutions and duly accredited private entities for free distribution of use of victims of calamities upon declaration of a national state of calamity. Companies as part of their CSR to extend aid relief to victims of calamities that send relief goods from their mother companies abroad will be guided by the JDO. In line with the Development Bank of the Philippines (DBP) drive towards providing more responsive and efficient financing programs to micro, small and medium enterprises (MSMEs). The DBP asked the assistance of the Philippine Exporters Confederation (PHILEXPORT) in the conduct of Focus Groups Discussions (FGDs) with key industry stakeholders. The objective of the FGDs is for DBP to be able to gather inputs, suggestions and recommendations as to how can they provide financing programs and services tailored to the needs of MSMEs. DBP has requested PHILEXPORT to identify some exporters to participate in the FGDs. Director Arnold Benitez attended the public consultation where the BOI presented to the Industry association representatives the 2017 IPP with the propose theme: “Scaling Up and Dispersing Opportunities”. The secretariat had already disseminated the 2017 IPP Specific Guidelines for All Qualified Manufacturing Activities Including Agro-Processing for comments from our members. The deadline of submission to BOI is on February 28, 2017. Offhand, the guidelines has 5 criteria and for a manufacturing activity to qualify, at least three of the criteria has to be complied with for medium and large-scale enterprises (MLEs) and at least one for micro-small scale enterprises. As the theme of the IPP suggests, Inclusivity is hoped to be achieved. The Technical Education and Skills Development Authority (TESDA) in coordination with Samahan sa Pilipinas ng mga Industriyang Kimika (SPIK) held the Public Hearing on the Proposed Assessment for the Training Regulation for Chemical Process Operators last February 28, 2017, in Pinnacle Hotel, Davao City. It was attended by representatives from SPIK Member companies, Academe – Ateneo de Davao and Affiliates – PICHE Davao Chapter.